For the twenty-third year in a row, we are teaching at the Atlantic Brass Quintet Seminar, which is being held in Boston at Northeastern University. It is also a special year, because 2015 marks the 30th anniversary of the Atlantic Brass Quintet. Along with our colleagues in the Triton Brass Quintet and John Faieta, a former founding member of the Atlantic Brass Quintet, we are working with fifty students from across the country as well as students from Canada and Chile. The students from Chili are from the University of Talca and their Professors, Natalie and Alex Young, are alumni of the Atlantic Brass Quintet Seminar. With help from their University, our scholarship fund and an IndiGoGo campaign, they were able to make the trip. On Thursday, the “Tritantic Brass Ensemble” played a recital of music by Gabrieli, Schumann, Prokoviev, Jobim, Brian Thomas and Wes Hopper. The second half of the concert was a jazz jam session featuring both faculty and students. On Friday, the ten student brass quintets gave their first of two performance classes and that did a fantastic job of tackling some very difficult literature. We are halfway through the seminar and about to enter into our second week. Tonight, our guest artists Sam Pilafian returns and all of us looking forward to his masterclass and breathing gym class. We owe a lot to Sam and the Empire Brass, since they were our mentors and many of us attended and eventually taught at the Empire Brass Quintet Seminar at Boston University Tanglewood Institute. Two weeks ago, the Atlantic Brass Quintet spent a week rehearsing, performing and recording in New Jersey. We rehearsed and recorded Dmitri Tymoczko‘s “Rube Goldberg Variations” for prepared piano and brass quintet at Princeton University. We premiered it at Rutgers University along with music we have been playing this season. The next day we recorded the Tymoczko piece at Princeton. But with more than a week before the seminar started, I had a “free week” to wander around and visit family and friends. After that I rented a car and drove to visit my Aunt and cousins in Connecticut, my parents and sister on Cape Cod, my first teacher Jerry Shaw in Middleboro (we played duets! ), the parents of a friend in Raynham (I got to see the new Bridgewater-Raynham Regional High School), spent some time with Andrew Sorg and got to meet his adorable daughter Charlote, spent some time hanging out with my best friend (since Kindergarden!) Bruce, saw Tower of Power in Lowell, MA, and spent some time in Boston with my brother Kevin. I also caught up with old friends and my sister-in-law. What a week! 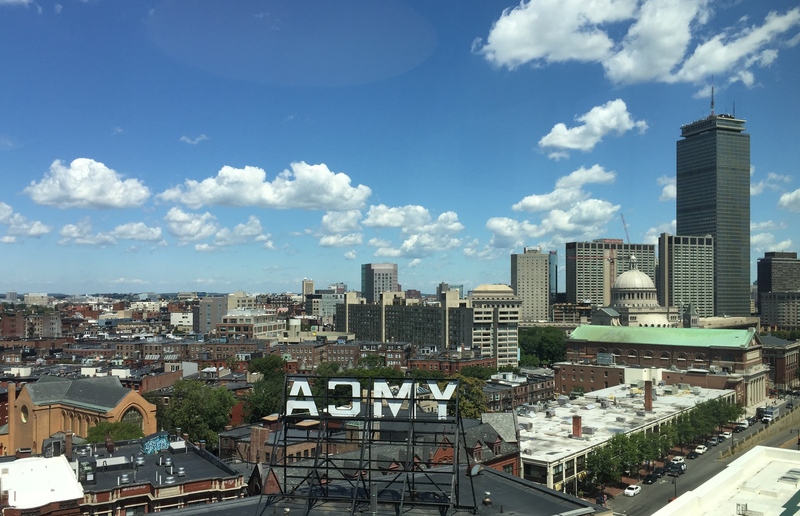 It’s always fun spending time in Boston, and this year we have had the pleasure of living in “East Village“, a brand new dormitory on the Northeastern Campus with stunning views of Boston. I’m looking forward to this second week working with these amazing students and our Atlantic Brass Quintet recital on Thursday. We will be premiering a lot of new music, including new arrangements of music by Bach and Mehldau by our newest member, Tom Bergeron, and two works we commissioned – Apex Predators by Catherine Likhuta and Balkan Dances by Kevin Walczyk – in addition to a second performance of Rube Goldberg Variations. The concert is Thursday, August 13th at 7:00pm in Blackman Auditorium at Northeastern University.